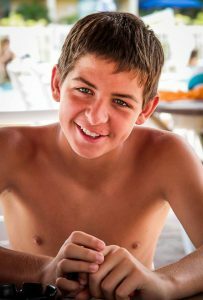 Alex was 12 years old when parents took him to the pediatrician for a routine examination. His pediatrician became concerned after hearing an abnormal heart beat. He was referred to a pediatric cardiologist who after a series of tests, diagnosed Alex with Wolff-Parkinson-White (WPW) Syndrome. During his ablation it was found that the WPW pathway was benign but SVC was found further into the heart. Alex considers himself fortunate and wants to pay it forward.